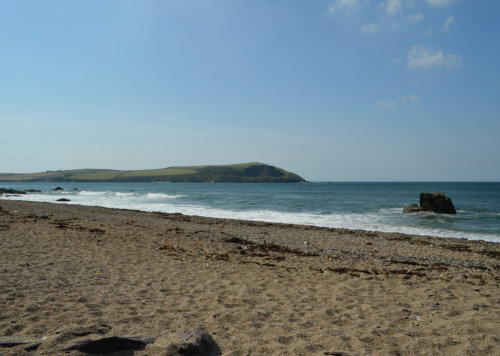 Tucked just inside the Camel Estuary, and with the combination of Atlantic swells and the gradually shelving, sandy beach, long, slow breaking waves are produced that are ideal conditions for improving your surfing skills at every level from novice to advanced. To the left of Polzeath is the Greenaway which is a gentle walk along the cliffs to Daymer Bay passing Trestram (Greenaway) Covelet and Broadagogue Cove, renowned for its pebbly beach and tiny Cowry shells. New Polzeath and Pentire Glaze Haven are located to the right of the main beach in the direction of Pentire Head, which affords stunning views over the bay and the camel estuary to Padstow and beyond to Trevose head Lighthouse. 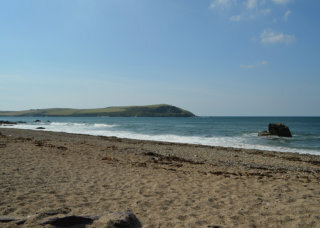 Pentire Glaze Haven can only be reached via the beach at fairly low tide, but there is a footpath at New Polzeath that accesses the beach when the tide is up. 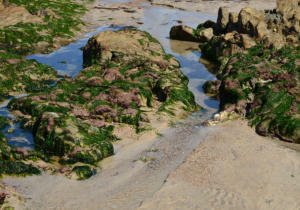 This stretch of coast offer a gentle flat walks if you head south along the coastpath towards Daymer and Rock. 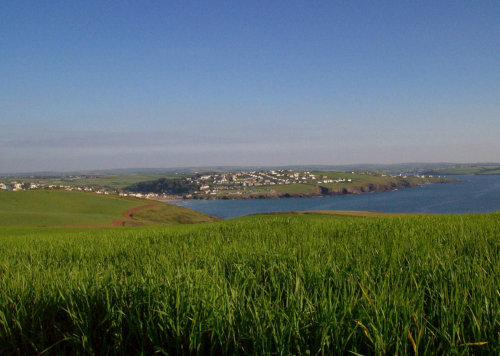 If you head north you may find the going a little more taxing as the footpath wends up from Pentire Glaze Haven (< image) to Pentire head, but in my opinion it is worth the effort as the views are spectacular. The surfing here at Polzeath is generally superb and is a major draw during the Summer season. The swimmers and rock poolers are also well catered for so take note of the lifeguards requests and you will have a great day out here. The surf life saving club operates throughout the season. The Rumps are just north of Pentire Head and are well worth a look. The way that the land has been shaped by the elements here is quite beautiful. 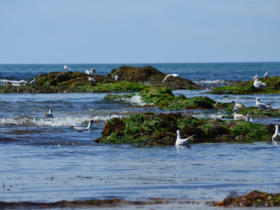 Newlands is just off the coast here and seals can often be seen sunbathing. Broadagogue Cove can be reached from either Daymer or Polzeath via the coastal footpath know as the Greenaway (Grenaway). The photograph to the left shows Stepper Point in the distance taken from the beach. Broadagogue is a very sheltered cove with coarse sand to small pebbles. Not good for sandcastles but great for finding cowries. Polzeath and New Polzeath in North Cornwall The Polzeath page is sponsored by Latitude 50 Polzeath is a fantastic area to stay winter or summer. 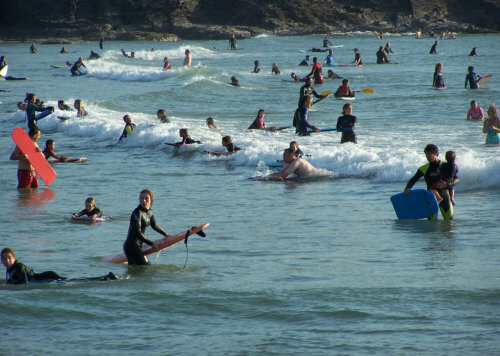 With dolphins and seals has regular surfing companions - Polzeath is a place you'll want to visit time and again. 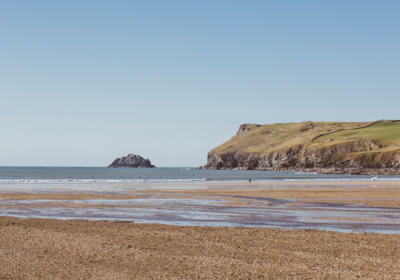 Polzeath beach is one of the finest surfing beaches in the U.K. 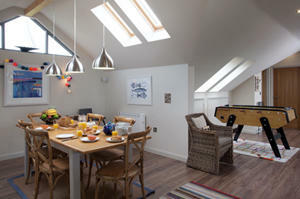 The amenities at Polzeath are excellent, with plenty to do in the area both day and night. 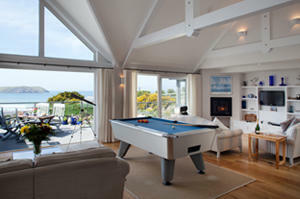 There are extensive facilities to cater for all tastes, from walkers to surfers and then some. Perfect for families and couples. There are restaurants and pubs for the self catering element, hotels and bed and breakfast establishments that afford the more pampered approach to holidaying and plenty of caravan parks and campsites in the local area for the more down to earth travellers. 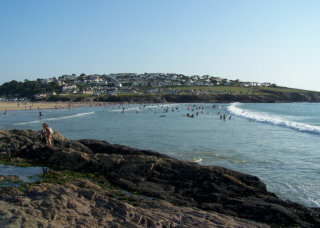 Due to its location Polzeath has a very mild winter climate and a generally hot and sunny disposition during the summer. So pretty much all year appeal. 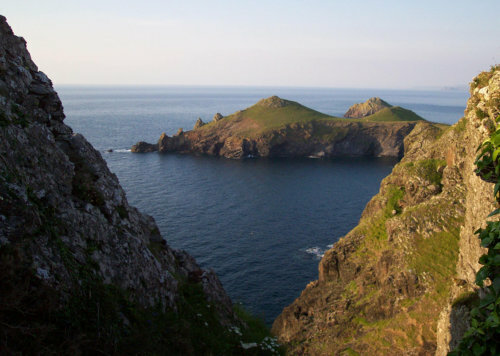 Newlands is the small islet off Pentire Point and further North The Rumps over look the The Mouls. Polzeath and New Polzeath lay on the coast of Hayle Bay. 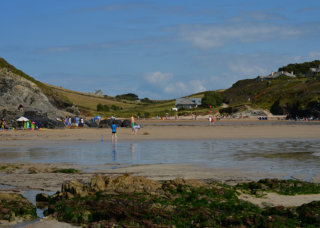 Padstow Bay begins at Trebetherick Point and encompasses the Camel Estuary mouth to Stepper Point. 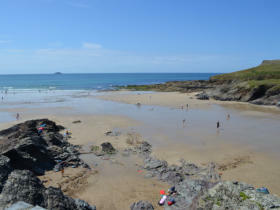 Polzeath is listed has one of the best all round beaches in the whole of Cornwall. More Polzeath information. 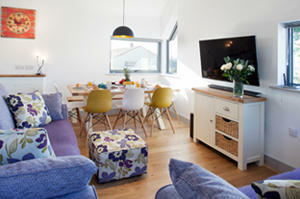 Visit North Cornwall Accommodation if you are looking for accommodation at Polzeath. 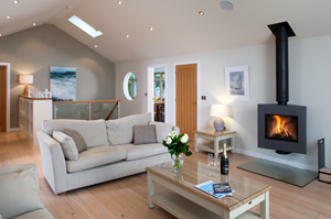 Latitude50 are experts in providing outstanding holidays on the Cornish coast. With a large collection of self-catering houses ranges in and around Polzeath and New Polzeath, you are certain to find a property to suit your needs. 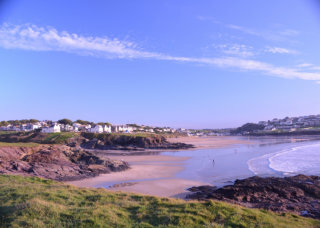 Properties range from modern beach front houses with stunning sea views through to traditional character houses a stones throw from the beach. Many of the properties are dog friendly so you can enjoy a holiday with your four-legged friend. 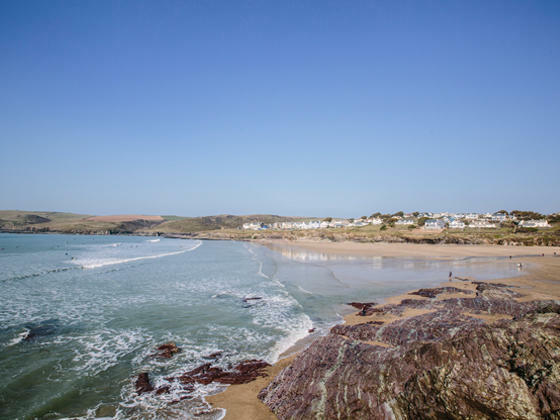 The staff at Latitude50 know this part of North Cornwall inside out, with tips on everything from the best surf spots to secret dog walking routes. And because their office is right in the heart of Rock, they’re never far away if you need them. 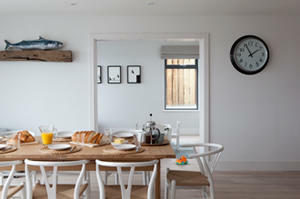 Latitude50 also offer accommodation in and around Rock and Daymer Bay. Tel: 01208 869090 WEBSITE: www.Latitude50.co.uk E-Mail: Latitude50 High quality self-catering accommodation in and around Polzeath and New Polzeath ************************************************************* Please take care along our shore, and you will leave here wanting more. But if the warnings you ignore, then you may get more than you bargained for. 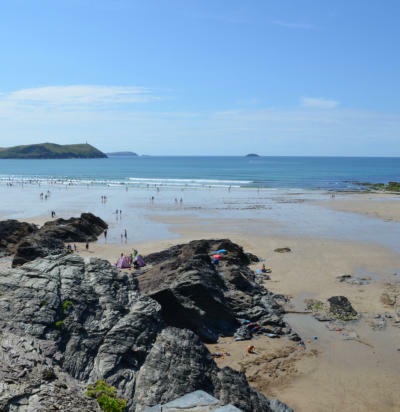 Stay Safe Play Safe ************************************************************* Polzeath is located on north Cornwall's rugged Atlantic coast. Tel: 01208 869090 WEBSITE: www.Latitude50.co.uk E-Mail: Latitude50 High quality self-catering accommodation in and around Polzeath and New Polzeath ************************************** Please take care along our shore, and you will leave here wanting more. But if the warnings you ignore, then you may get more than you bargained for. Stay Safe Play Safe *************************************** Polzeath is located on north Cornwall's rugged Atlantic coast.